Claire makes her living reproducing famous works of art for a popular online retailer. Desperate to improve her situation, she lets herself be lured into a Faustian bargain with Aiden Markel, a powerful gallery owner. She agrees to forge a painting—one of the Degas masterpieces stolen from the Gardner Museum—in exchange for a one-woman show in his renowned gallery. But when the long-missing Degas painting—the one that had been hanging for one hundred years at the Gardner—is delivered to Claire's studio, she begins to suspect that it may itself be a forgery. Claire's search for the truth about the painting's origins leads her into a labyrinth of deceit where secrets hidden since the late nineteenth century may be the only evidence that can now save her life. B. 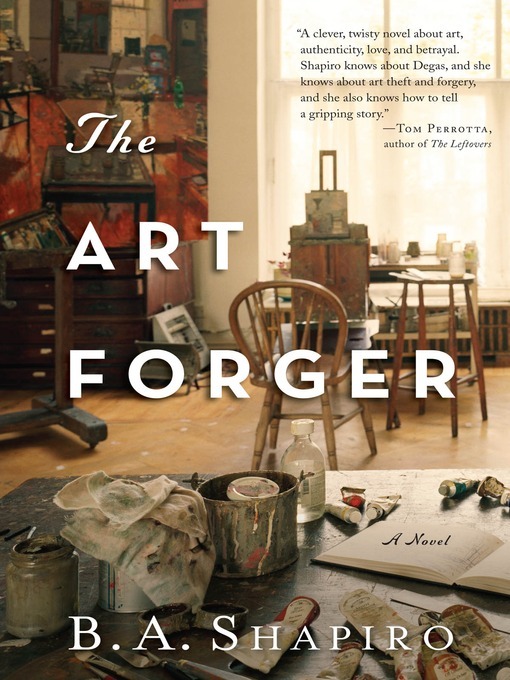 A. Shapiro's razor-sharp writing and rich plot twists make The Art Forger an absorbing literary thriller that treats us to three centuries of forgers, art thieves, and obsessive collectors. it's a dazzling novel about seeing—and not seeing—the secrets that lie beneath the canvas.